The Singapore Ministry of Manpower released the 2016 Public Holidays calendar. We could not resist. 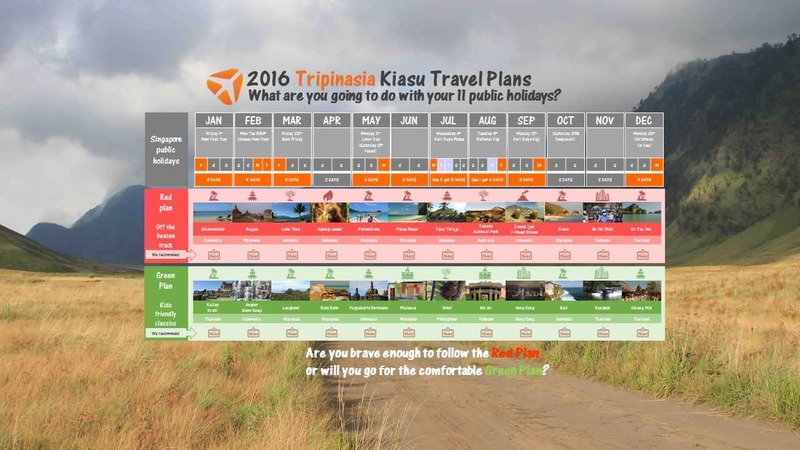 Discover the 2016 edition of our famous Kiasu Travel Plan! How to use the Plan? 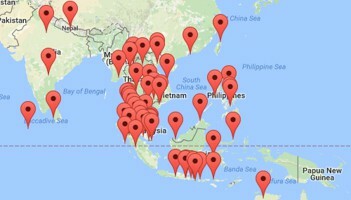 2 Saturdays (Vesak May 21th and Deepavali Oct 29th). Ask your HR. Depending on your company policy, these 2 days may be credited as a in-lieu annual leaves or converted into another day off (usually the following Monday). We assumed they would be credited as “in-lieu” to build our plans. 2 bridge weekends for which you will have to use some annual leaves to bridge the public holiday(s) and the weekend. Visit the official Ministry of Manpower (MOM) website for the list of the 2016 Public Holidays. Overall, 2016 is a pretty good year for travelers (2015 was exceptionally good. 2016 is good). Monsoon-free: nobody wants to spend a weekend locked in a hotel room watching the monsoon! Destinations are picked accordingly. Optimized duration: Life is short. Only 52 weekends and 12 months in a year. Use the longer weekends for the destinations that require or deserve more time. Save the short trips for the easy ones. Diversity: avoid temple or beach overdoses. Mix your trips. Beach, city, culture, nature. A little bit of everything. – The Red Plan (our favorite of course). For your inner Indiana Jones! On the menu, active volcanoes, Orang Outans, Buffalo sacrifices, millennial temples… Some destinations are not suitable for infants and babies. We included a mix of popular and off-the-beaten track destinations and a few relaxing destinations because adventurers have the right to relax too! We decline any responsibility for difficult Monday mornings back in the office after a tough hike, 10 hour in a car on a bumpy road or sacrificed buffalo blood stains on your clothes (or any of the above combined). – The Green plan is ideal for families. 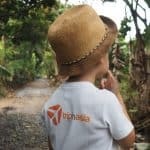 All destinations are kids friendly (at least per our standards). We included many classics so it’s a good plan for people who want to get a flavor of the region while taking it easy. It does not mean it’s boring. It’s just usually easier to reach than destinations on the Red Plan and more suitable with kids. Recommended hotel: we even picked the hotel for you so that you can book your hotel (or villa or tour in a few cases) directly and save hours comparing and choosing where to stay. Now that the secret is out on the 2016 Public Holidays remember to book early! We asked our secret tripinasia calculator to run a travel time and budget estimation for 2 persons for the 12 destinations of each plan. Ready? Take a deep breath. Green Plan: 120 hours and SGD 8,070 in transport only. Ouch! But… if you average this out per month and trip it’s actually “only”: SGD 335 to 350 per person per month. You will need to top this up with costs for accommodation, food and activities. You’ve been warned. Remember, although there are only 5 millions of us in Singapore, not all can fit in an airplane to enjoy these long weekends. And even if only a portion of us travel, early birds always get the best deals… So, what are you waiting for? 2015 is so… 2015. Book for 2016! You know where to go to get the best deals (and support this website) Agoda or Booking. PS: Haven’t booked your trips for 2015 yet? 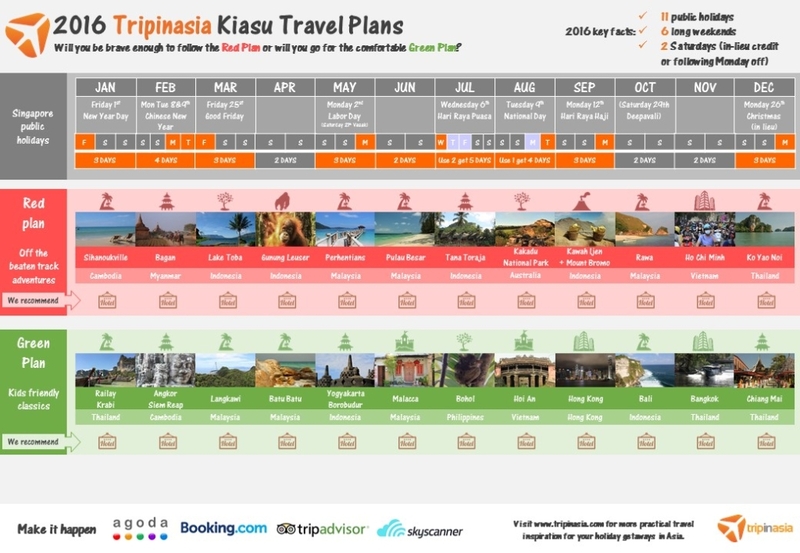 Check the 2015 Kiasu Travel Plan. Hurry up!